What does Impact Hub Zürich stand for? After our merger with Colab Zürich and the rapid growth we experienced over the past year, many have asked us this question. And rightly so. The original Impact Hub had a clear focus on social entrepreneurship when it started out in 2010. Over the years, we noticed that many people interpreted the term social in a narrow sense and we found ourselves in a niche. We realized that if we were serious about creating impact, we had to open up and position ourselves in a more inclusive way. So we started “dating” Colab and the vibrant tech community that they had built, driven by the conviction that social + tech = impact. Together, we developed a new slogan: We prototype the future of business. This felt good for a while as it embodied the essence of how we operate: rapid prototyping and “stumbling forward” to learn what works. However, the question that was left open is the kind of future we want to build together. We never finished the process to fill the future we want to live in with meaning and corresponding actions. Consequently, we started a deep co-creation process earlier this year to find some answers. We began by asking the community what words came to mind when they were thinking of Impact Hub Zürich. 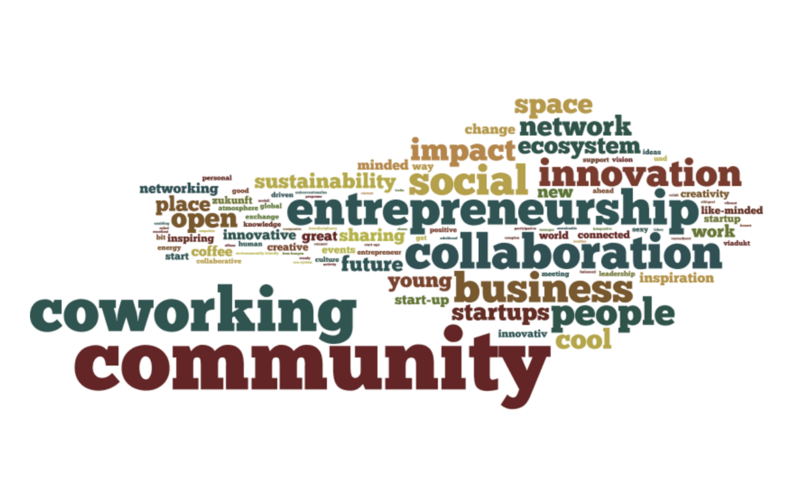 The most frequent word was community, followed by coworking, entrepreneurship and collaboration (see wordle below). We then did a workshop with the help of Publicis and 25 selected people from our team, members and partners to go deeper into the questions of who we are today, who we are not and who we want to be. The main finding was that many saw us as a kind of biotope where a diverse species of entrepreneurs and innovators come together to support and learn from each other. When asked about the core values that held this diverse community together, word clusters around the notions of entrepreneurship/prototyping (“we create”), collaboration/community (“we connect”) and sustainability/good (“we care”) emerged. To take the process forward, we started drafting a manifesto that tried to articulate the essence of these findings in an inspiring way. No easy task! First and foremost, we are a community of creators. People come to Impact Hub to build things they want to see in the world. What makes our community special is that people help each other succeed. If there’s one word that had to sum up the essence of Impact Hub it would be “collaborative”. Why radically? We know it’s a strong word and may even have some negative connotations. But the point we’d like to make is that the world needs to work together as one if we are to solve the many challenges of our time. And we cannot help but feel that there is a sense of urgency. That’s why we hope that Impact Hub becomes a place where the first impulse is to connect, share and collaborate. Across organizations, cultures and generations. Hence the notion of a “radically collaborative world”. The world doesn’t change one person at a time. It changes as networks of relationships from among people who discover they share a common cause and vision of what’s possible. This is good news for those of us intent on changing the world and creating a positive future. Rather than worry about critical mass, our work is to foster critical connections. This is what Impact Hub is all about. We follow our passions and put purpose over profit. We default to transparency and operate on trust. We value authenticity and bring our whole selves to work. We make bold experiments to learn what works. We create scenarios where everyone wins. We pioneer the regenerative paradigm. Of course these are just empty words until we put them into practice. So we just did a team workshop where we took a hard look at how we’re currently doing with regard to each and came up with action points on how to improve. The idea is that we begin with the team to start walking the talk and then invite the community (and ultimately the entire ecosystem) to do the same. The question remains how we define and measure success. What do we want to achieve in the end? Going back to the metaphor of a biotope, what we’d like to create is a thriving innovation ecosystem where people work together to solve the grand challenges of our time. In Zürich. In Switzerland. And all around the world through our global network of 80+ Impact Hubs. That’s how far we’ve come. To finalize the process, we’d like to hear your feedback on how all of this resonates with you and if you have any suggestions. Please fill in this short survey by May 16th to share your thoughts. And then what? We expect to finalize the wording by end of May and then get into rapid prototyping mode. In this sense, we’d like to dedicate the next Town Hall meeting to how we can truly live the new mission and operating principles as a community. And as we get better at living up to our ambition, we’d like to take it one step further and co-develop a manifesto for the entire Swiss innovation ecosystem with our partners and like-minded organizations. A Co-Manifesto so to speak. Helping us cultivate the art of collaboration to really crack the grand challenges of our time.